These days, thanks to the advent of low cost airlines, if we want or need to get anywhere far away in a hurry, we can just hop on a plane; but for some people that takes away the very point of travelling. Once upon a time, Marco Polo walked all the way from Italy to China! Indeed for many, a trip should involve seeing the landscape - moving around and exploring, covering ground - not simply landing in a place and then staying there till it's time to fly home! A classic example of long distance overland travel is to travel by rail with a flexible ticket - known generically in Europe as Euro-railing. Such tickets are available via many travel agencies and online rail ticket vendors, so with a little delving it's possible to find a deal that really suits you and your companions. Traditionally popular with young people, there tend to be huge discounts available to students. A typical ticket will allow you to visit anything from three to 20 countries, depending on how much you're prepared to spend, with the flexibility to make your itinerary up as you go along. 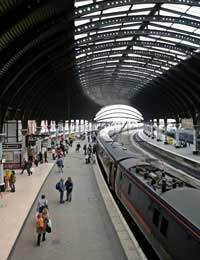 Travelling long distances by rail is also a great way to save on accommodation. Night trains with sleeping compartments travel most of Europe's main routes. They can be a bit cramped but if you're on a budget they save you both money and time. For those who'd like to go a little further there's Trans-Siberia. You can pick up the train just about anywhere in Europe and head to Moscow to begin a seven day, 6000 mile journey across Russia to the far east - Mongolia, Manchuria, China - you can even hop on a boat to Japan at the end of it, which comes highly recommended. Travelling by car abroad is a two-sided coin - it gives you the flexibility to go where you want, when you want (within certain parameters) and it can also act as emergency accommodation, but it can be very expensive - especially if you have problems. Campervans save you a fortune in accommodation but mean a significant outlay at the start, and when your not travelling the world they can be a tad impractical. Basic costs include the vehicle itself (owned or rented), petrol, toll booths and ferry crossings, insurance and of course maintenance. Risks include the car getting stolen (with your belongings in it), breaking down indefinitely and getting into an accident. If hiring a car be sure to go with a very reputable firm and pay the maximum insurance option. Also, make sure to understand clearly the terms and conditions of taking the vehicle abroad - most British insurers will allow you a maximum of 90 days abroad before your insurance becomes invalid. It's also important to read up in advance about different traffic laws in each country, as they do vary slightly. Hitch-Hiking is surely one of the oldest and most romantic ways to travel - the most prolific type of travelling adventure. It's less common nowadays than it was in the past, but the belief that the world is a more dangerous place now than it was before is unjustified - we were just less aware of the dangers before! This form of travel can land you in hot water however, and is probably most dangerous in northern Europe and the USA compared to the rest of the world. Obviously having a travel partner significantly reduces the danger - but it also reduces your chances of getting a lift, especially two males. Try to always have a charged mobile phone for emergencies, to always know where you are and let other people know, and if possible, always begin and end each ride in a public place like a service station, not by the side of the road in the middle of nowhere! The seriously dedicated overland traveller will employ all of the above methods of travelling and doubtless have an extremely interesting trip. Taking each short step as it comes means that your trip can take twists and turns that make it a so much more thrilling experience. Sure it takes longer to cover ground, but no days are really wasted as you slowly make your way through the landscape of any given country - and there's no such thing as 'the wrong train'!